WE’RE ONE YEAR OLD!!! Hooray! And what a year it’s been! We started humbly with a website and a Facebook page and we’ve grown into Twitter & Instagram, joined Patreon, and we’re officially accepting period related stories to create into comics too! Wow! We’ve certainly enjoyed ourselves. We hope you have too! Thank you for all of your support and love! And a special shout out to my Patrons on Patreon, they have been super supportive and have given great feedback! THANK YOU!! Please feel free to like, share, retweet, regram, blog, text, however you prefer to share! 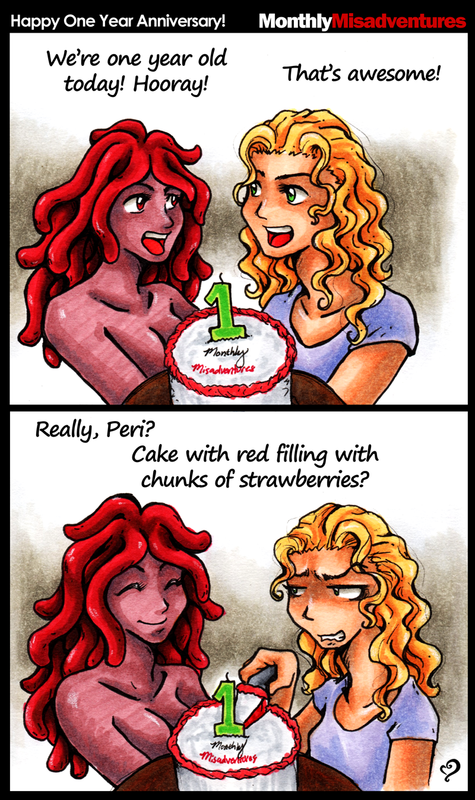 Here’s to more years of Monthly Misadventures and Peri!